I love Thinking Maps! If you haven’t heard of them, a quick search will help you find lots of information. In a nutshell, Thinking Maps are a set of 8 specific graphic organizers based on 8 cognitive skills. They are meant to help students visually represent content based on relationships. The focus of this post will be on The Brace Map. Brace Maps are used to analyze the structure of whole/part relationships. The Brace Map is quite popular in my classroom. Here are two ways we have used it this past year! At the beginning of the year while setting up reading workshop we always discuss genres. This is a great opportunity for a Brace Map. 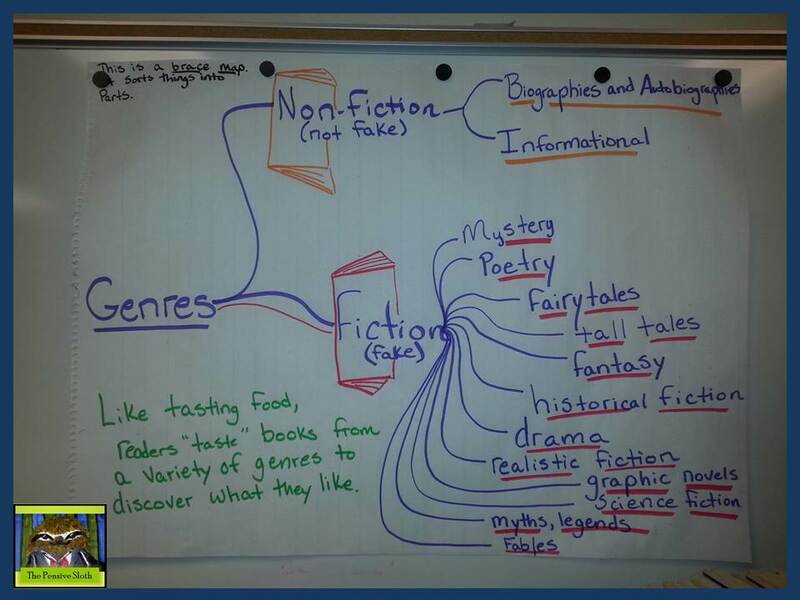 You can see we started with genre and categorized it into fiction and non-fiction. We then took it one step further and broke each of those into parts. A Brace Map we created at the beginning of the year when learning about different genres. Ok, this next one is a little funny. I have to say that my anchor charts don’t always turn out like those glorious ones you see on Pinterest with all of the color and professional illustrations. Someday I fully expect to see them on a FAIL meme. I was not blessed with artistic talents. Nope. But this does not stop me in adding illustrations to my anchor charts! It is important for students to have illustrations to accompany new vocabulary. ELL students really need these and the brain loves color and novelty, so illustrations are a must! I don’t pre-make my anchor charts. We gather together to record our thinking and I’m usually in a hurry to keep up the momentum, so I quickly sketch! My students and I get a chuckle sometimes (OK, often) at the drawings, it gives them something to look forward to when we meet on the rug, and it lets them know that it is OK to take risks and laugh at your mistakes. Oh, and we label things a lot so that it is obvious what was drawn there. 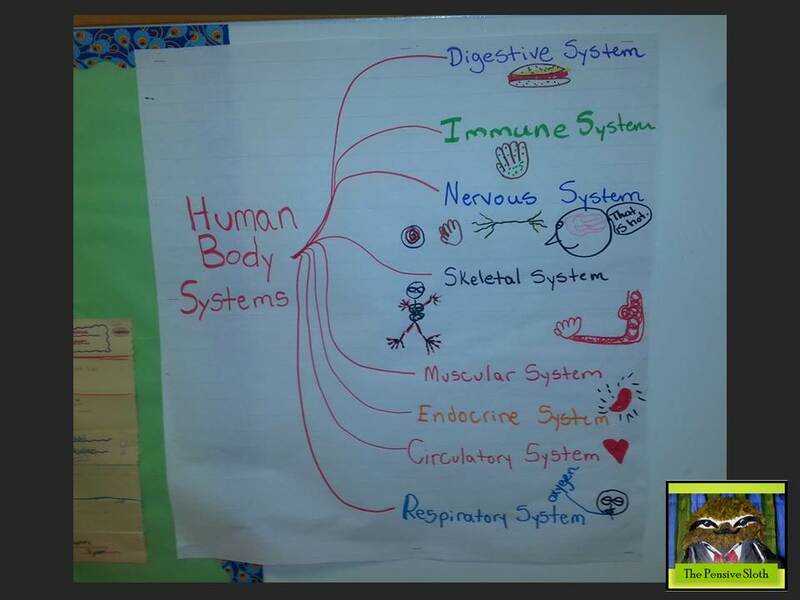 Here it is folks…a Brace Map of human body systems that we created during our health unit. A hilarious anchor chart on human body systems. We used a Brace Map to sort the whole into parts. I hope you got a chuckle, and perhaps learned a little about how to use Brace Maps in your classroom!